June — 2013 — The War Dolls - Girls Game Too! We’ve all experienced it. We walk into the car dealership and it happens. We buy a house, and we are subjected to it. Sometimes, we post an article about Space Marines on a blog and a nice man is kind enough to inform to us exactly what we don’t know. Thank you, sir, for mansplaining that to me. Mansplaining is a common ailment affecting men from all walks of life, no matter race, color or creed. Certain environments, such as sports bars and garages, can exacerbate the condition exponentially, but no area is truly safe from the malignant disease of the mansplain. And it is a shame when it happens to gamers, but it does, a lot. I have an unpopular opinion. There, I said it. I know that makes me really unpopular in the music world. There’s probably not a genre that’s more hated than country. People that say they like any kind of music immediately laugh and say “Not that!” when you suggest country music. It’s a unique genre, and even when it crosses over to pop (Taylor Swift, Lady Antebellum) they change bits and pieces to make it more poppy. They swap banjos for guitars, remove fiddles, and autotune voices, because otherwise someone that likes cool pop music might be caught listening to country. Yup, that’s right, I’m officially a homeowner. Which is pretty freaking cool. Wow! The post I made on why I disliked Space Marines resulted in a lot of excellent conversation in the comments section which touched on a lot of issues I didn’t get to in my previous article, so here’s a repost of some of the commentary, and my rebuttal in an effort to make myself more clear and to offer a differing opinion on the subject. 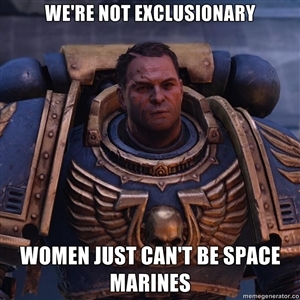 I would also love to make it clear that I do not dislike anyone for liking or playing Space Marines, and my issue with them is strictly with their portrayal by Games Workshop.